The matches are played with alternating colors. I have not analyzed yet how the Persians are doing relative to the Spartans. Now I switched to Playing ChessV against Catalyst, the first version of an engine made by Richard Albert. (He still has to implement a hash table, and work on the evaluation.) I hope to have more engines soon. There are two people working on one (not counting myself). I did run some 5-men Spartan end-games with my tablebase generator, and can confirm that the following endgames are all 'generally won' to white: moves to conversion: max typ K+Q+B vs K+W 44 10 K+Q+N vs K+W 45 10 K+Q+B vs K+G 33 18 K+Q+N vs K+G 39 18 'Generally won' means that with white to move it is virtually always won, except for the ~1% of cases where the initial position happens to be a fork or skewer against your K+Q. With black to move these are only won in about 35% of the cases, because in the remaining 65% the powerful black defender (W or G) will be able to capture either King or Queen in the initial position. The first two end-games can already be found on this site (calculate by McCooey, where Warlord is called Pegasus), those with the General are new. Very nice. It shows the power of a jump. A diagonal slider can seldomly do this (except in fool's mate), but here it does not matter that d2 is defended several times. Blocking the check is not possible. I guess tactical motifs like this are what makes a pair of Lieutenants about equivalent to a Bishop pair. Something that much surprised me. Apparently the single non-blockable 2-square jump has nearly the same value as all distant moves of a slider, which can be blocked. There are some characters on this page that don't look right in either UTF-8 or Latin-1. In UTF-8, they show up as diamonds with question marks, and in Latin-1, they don't make sense. When you can, please update these characters to whatever they should be in UTF-8. It looks better now. It is strange that should be causing any trouble. A few Spartan chess puzzles for your amusement and critique. Shortly I will post their solutions or the refutation as it is easy to err on such puzzles. Post your solution, comment or critique. post it to the official Spartan Chess website crediting you as its author. puzzle 2 a5-a3+ a2-a3 b2-b1+ promotes if promote to RN, then a1-a2 b1-c3+ a2-a1 c3-a3 mate if promote to RK [aka: General], then mate. Mr. Anonymous ---------------------- puzzle 2 a5-a3+ a2-a3 b2-b1+ promotes if promote to RN, then a1-a2 b1-c3+ a2-a1 c3-a3 mate if promote to RK [aka: General], then mate. ---------------------- b2-b1 is not a correct Spartan Chess move. The hoplite, or Spartan pawn, moves diagonally and captures straight ahead. Since there is no enemy piece on b1 the hoplite cannot get to that square. Also there is no RN. There is the General=RK and the Warlord=BN. The solution is a bit trickier. Two more Spartan Chess puzzles. The solutions will be posted separately in a day or so. Have you ever seen chess warriors so menacing? 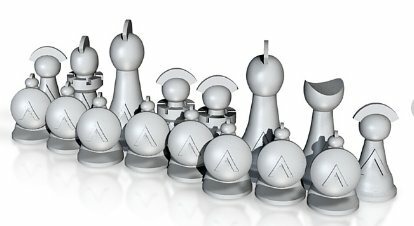 A Spartan chess set is now designed and prototyped. I'd suggest changing the "punchline" to something more descriptive than "http://www.spartanchessonline.com". Suggestion: "The spartan army with 2 Kings and novel pieces fights against the persians (standard chess army)" The punchline occurs in several listings on this site, including the favourite games listing. Nice, but it still says 'Anti-King Chess'. This game is one of the top favorites of this site. As it also does feature a fair number of unorthodox pieces that makes it deservant of an interactive diagram. Especially since almost all comments on it have been totally garbled by messing up their layout. Because of the asymmetry of this variant it required some special attention to make sure the diagram would only allow each side to promote to its own pieces. What I did was define the promotion choice with an asterisk before each piece, meaning it can only come from the holdings. Then I stuffed the holdings initially with eight of each eligible piece type (enough to promote all Pawns to it). Except for the Spartan King, which would only be a valid promotion choice if one of the Kings was captured. So I defined the holdings type such that it would accumulate captured pieces of the original owner. By starting without Kings in hand the Spartans then can only promote to King when one of their Kings is captured. Only the Persians can castle, and this forced the Persian and Spartan Kings to be defined as different piece types. (If castling is specified with the aid of an O atom, the diagram assumes it is with a Rook or a corner piece of any type. And we do'nt want the Spartan Kings to castle with their Lieutenants!) This has the dubious effect of the Spartan Kings not being considered royal (as the diagram only considers one piece royal, by default the last one defined). So moves of Spartan Kings into check are not 'grayed out', like they are for the Persian King. But of course this is justifiable, as the Spartan King can actually expose itself to capture (if there still is a second one). So such moves can be legal. The diagram does not understand extinction royalty. I see a lot of work has been put into this game and it has been favorited by several people. However, I don't see a Game Courier preset. Is there one of these currently and if not, would it be violating any copyright policies to impliment one? Seems odd to have one of the top favorited games on the site without a preset. I think people have always felt free to implement presets that had not yet been created. It is unlikely there would be an objection. In the case of Spartan Chess, I know the inventor wanted a GC preset and had created some new piece graphics to be added to the Alfaerie set for that purpose. This was probably about 6 years ago, but they should be in my email. I will dig them up and get them uploaded and get a Piece Set created so that the pieces can be identified by proper notation. Then let's play! It looks like a CWA theme game.